Say goodbye to that annoying buzz created by overhead fluorescent light bulbs in your office or residence hall. 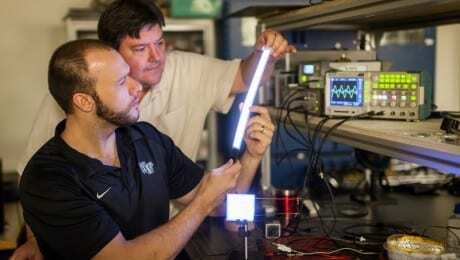 Wake Forest scientists have developed a flicker-free, shatterproof alternative for large-scale lighting. The team uses a nano-engineered polymer matrix to convert the charge into light. The technology allows the researchers to create an entirely new light bulb – overcoming one of the major barriers in using plastic lights in commercial buildings and homes. The research supporting the technology is described in a study appearing online in advance of publication in the peer-reviewed journal Organic Electronics. Graduate student Greg Smith has worked on this project for about two years, first developing a system to test the efficiency of the device.